The Trieste area has a wide range of accommodation to suit all budgets, ranging from inexpensive hostels to five-star luxury establishments. A 30-minute drive from Trieste Friuli Venezia Giulia Airport (TRS), the downtown area contains a wide choice of quality hotels within walking distance of the main attractions, with many cheaper options spread throughout the city. There are no hotels specifically located at the airport, although many are located within a short drive. Some hotels offer a pick-up service from the airport, although passengers should usually arrange this prior to arrival. One of most popular and closest hotels to Trieste Friuli Venezia Giulia Airport is the Holiday Inn, which is situated near to Duino Castle and contains around 80 guest rooms, with business facilities for up to 100 delegates. Hotels in and around the centre of Trieste tend to be fairly basic and functional, lying approximately 33 km / 21 miles south-east of Trieste Friuli Venezia Giulia Airport (TRS). A number of popular budget hotels can be found between the city centre and the busy train station, with most rates including breakfast within the price. 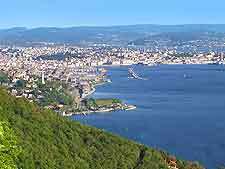 Those searching for budget accommodation in Trieste should consider the HI Hostel, which is located around 7 km / 4 miles from the city centre, along the Viale Miramare. Whilst the rooms in the hostel are fairly simple, the views of the shoreline are breathtaking. Popular mid-range accommodation in the city of Trieste includes the Alabarda Hotel - on the Via Valdirivo in the New Town district, the four-star Continentale - on the Via San Nicolò in the heart of the city centre, and the Nuono Albergo Centro on the Via Roma - offering some of the best rooms in Trieste. Also worth noting, the Centrale Hotel on the Via Ponchielli boasts an appealing spot, just a short walk from the Grand Canal.